Professor Blumenthal did path-breaking work in medieval intellectual Jewish history with his early studies in Yemenite philosophy, his two-volume textbook on Jewish mysticism (Understanding Jewish Mysticism), and his later work that established the concept “philosophic mysticism” as a category of analysis in medieval philosophy and mysticism (Philosophic Mysticism: Essays in Rational Religion). Professor Blumenthal also did innovative work in modern Jewish religious thinking: in spiritual theology (God at the Center), in post-shoah theology (Facing the Abusing God: A Theology of Protest), and in social psychology and moral education in the post-shoah era (The Banality of Good and Evil: Moral Lessons from the Shoah and Jewish Tradition). His newest book, Keeping God at the Center: Contemplating and Using the Prayerbook, is a return to his work in Jewish spirituality. Professor Blumenthal is also the subject of a book in the series Library of Contemporary Jewish Philosophers, ed. by H. Tirosh-Samuelson and A. Hughes, entitled David R. Blumenthal: Living with God and Humanity. In addition, Professor Blumenthal was among the earliest scholars to use multi-textual writing in “Text-ing" in Facing the Abusing God: A Theology of Protest), “Reading Genesis,” “Praying Ashrei,” and “The Creator and the Computer.” He is the author of Portal for Jewish Prayer, published in Reverberations and of Keeping God at the Center: Contemplating and Using the Prayerbook. He has also encouraged students to write creative essays and has put up their work on his website. Finally, Professor Blumenthal has reached out from Religious and Jewish Studies to the arts and, together with his wife Ursula, has curated an exhibit, with a website and podcast, of Salvador Dali’s suite of lithographs, “Aliyah, the Rebirth of Israel.” He has taught a course on the Akeda and its expression in art, sculpture, literature, and music. 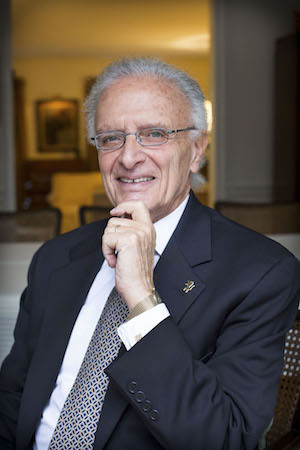 More recently, Professor Blumenthal has helped to establish an internet data base for Israeli and Topical Judaica Philately and has hosted a course on this topic based upon the holdings of Emory University. Professor Blumenthal is a member of the European Academy of Sciences, the American Academy of Religion, and the Rabbinical Assembly of America. He also received a Doctor of Humane Letters from the Reconstructionist Rabbinical College. Visitors to this page are welcome to download and use the material. Professor Blumenthal only asks that the requisite courtesy and law be observed in crediting him. He welcomes inquiries and can be reached at reldrb@emory.edu or by phone at 404-727-7545. Translated into Slovak by Barbora Lebedova, 4/10/18. (Web version). The Creator and the Computer. Translated into Swedish by Weronika Pawlak, 9/22/17. (Web version). “Madonna’s “Isaac” / Madonna’s Akeda: A Lesson for Scholars, Old and Young,” The Immanent Frame . Portal for Jewish Prayer, Reverberations. Salvador Dali, "Aliyah, The Rebirth of Israel (revised 5/25/2018). Translated into Hindi by Nikol Barton, 5/15/2018. (Web version). This Home Page and the material linked to it is copyrighted (c).